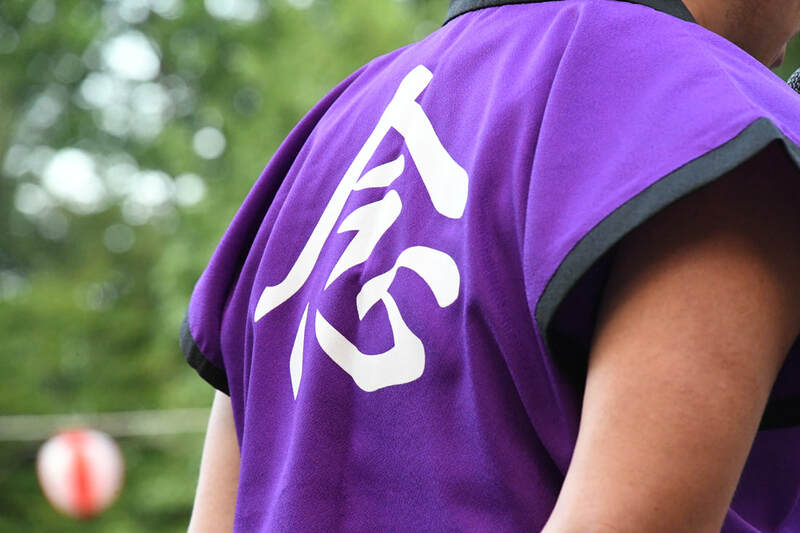 On the back of the happi is the symbol for Nen, the first syllable in Nen Daiko's name. Nen Daiko was named by Ekoji's founding minister in 1994, Rev. Kenryu Tsuji. Nen Daiko's happi coats and obi were made by the Japanese taiko costume company, Dodon. 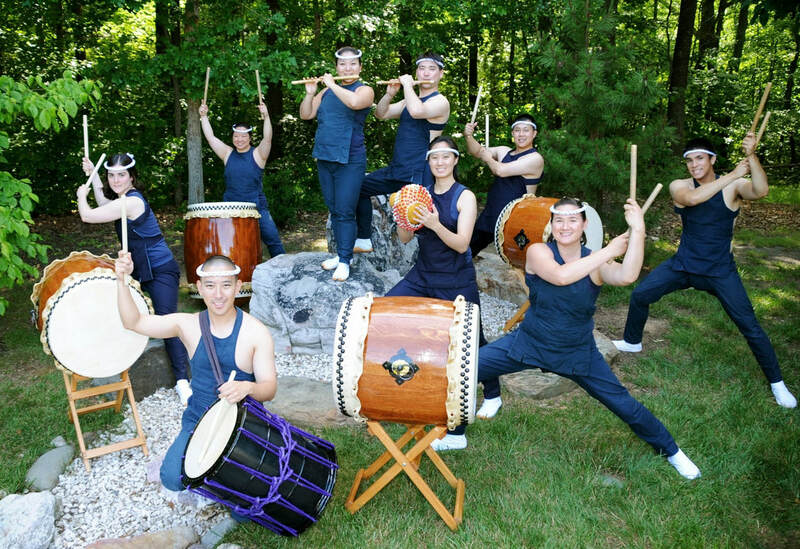 They were first worn in Nen Daiko's 20th Anniversary concert in August 2014. 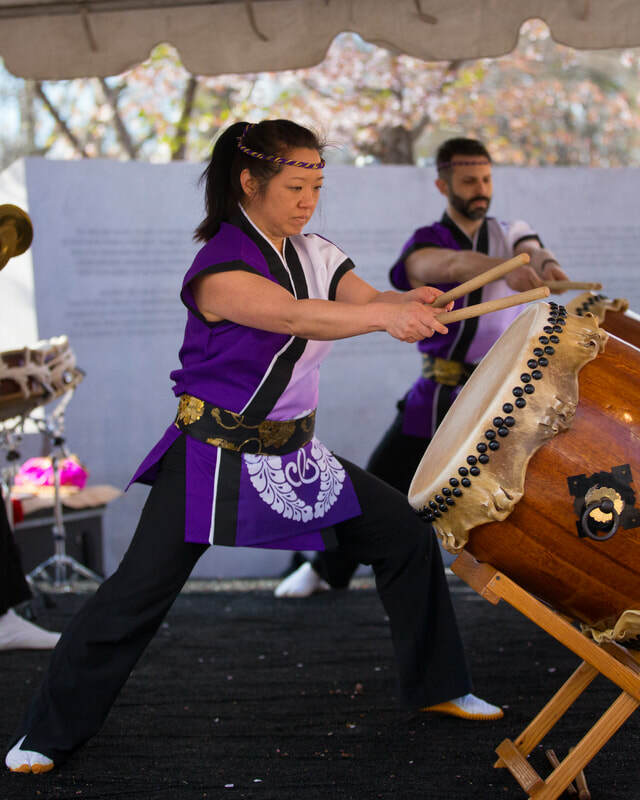 The white flower on the front of the Nen Daiko happi is a wisteria. This design of two wisteria blossoms in a circle with intertwining vines is the official crest of Jodo Shinshu Hongwanji Buddhist Temples. Nen Daiko is an affiliate group of Ekoji Buddhist Temple, which is a Jodo Shinshu temple. Wisteria are symbols of the transitory nature of life. In Jodo Shinshu tradition, the blossoms bloom with their heads hanging down, symbolizing humility. ​The color purple is associated with the wisteria flower. 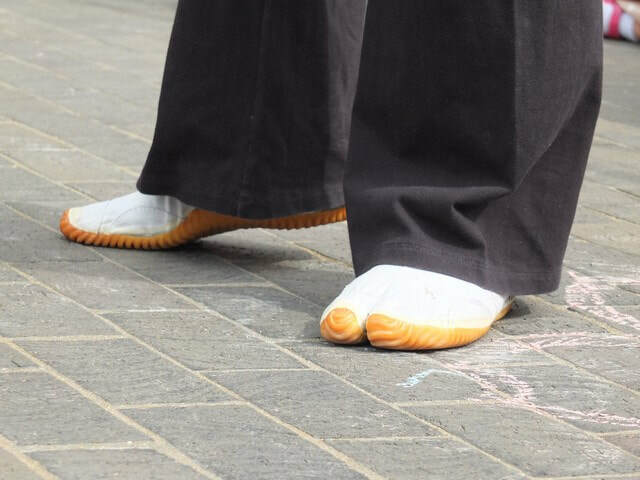 Nen Daiko members wear jika-tabi for footwear, which are ankle-high boots. They were traditionally worn by construction workers, and have a separate compartment for the big toe to allow a better grip on uneven surfaces. The jika-tabi have a rubber sole, allowing for some cushioned protection from the hard ground. The headband - or hachimaki - typically is worn to focus one’s energy, but it also can have a practical purpose like keeping the sweat from running down into our eyes when we play. Nen Daiko members wear the hachimaki lower in the front then back. It forms a diagonal line sloping forward. 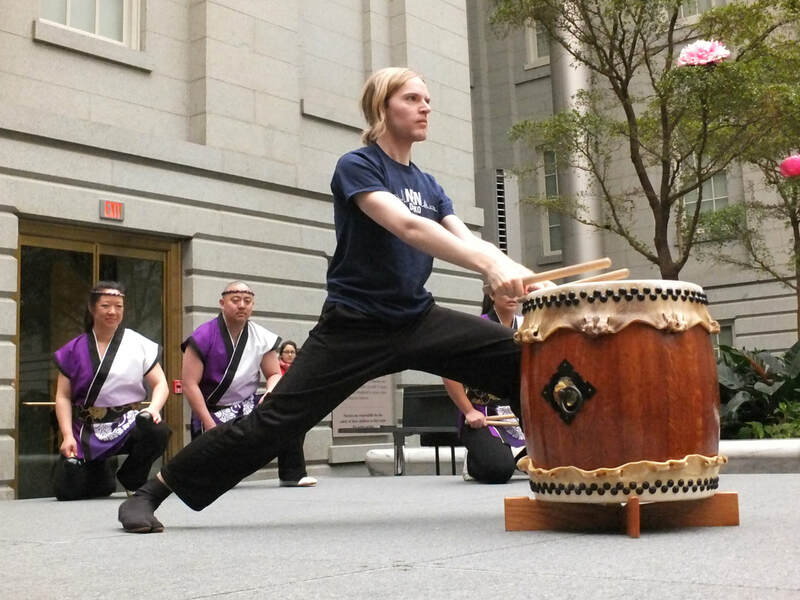 Nen Daiko's apprenticeship program typically goes from October to June. During this time, when an apprentice performs, she or he wears the Nen Daiko t-shirt. After passing three evaluations, the apprentice becomes a full performing member and can wear the full uniform. You can purchase your own Nen Daiko t-shirt at our store! Before 2014, the group had a variety of uniforms. The uniform that was most long-lasting was a traditional navy haragake (apron) and wrap pants with a white hachimaki. A haragake was worn traditionally as work clothes in Japan. It has a pocket for tools on the front.